Desire that ”I want petting with people” is universal. Not only mere visual experience, a variety of reproducible and practice have been carried out through VR and AR. been developed the way of interact with reality enough to misunderstand that it is the actual experience. So, we have developed a system “SRxSI – The system substitute reality to delusion” by using the SR technology as a platform. The Substitutional Reality system is an experience platform that blurs boundaries between live and past. In contrast to the technologies “to assimilate virtual to real”, which have been developed in Virtual Reality and Augmented Reality, the SR system manipulates “the users’ subjective reality” itself by inserting the past seamlessly into the present. By synchronizing the experience of SR system to audio and haptic stimulation, participants can feel intensive reality and excitement. 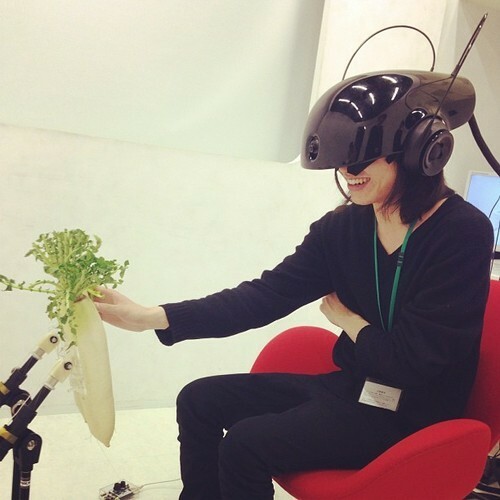 In this work, By combining SR with the touch device so called “Sexual Harrasment Interface,” a batch of radishes which moans to the touch, you can experience touching a beautiful girl in an illusion. Those experiencing it will all turn ecstatic,but will look from the outside like a grinning weirdo groping a vegetable. We conducted an experiment for mens several times, and it was well received. (20% of participants evaluated it as ”very exciting” in the subject questionnaire, and 80% were ”pretty exciting” ). Technological development　inexorably intervene to sexual desire which fundamental desire of human beings. However, the topic is hidden in our society. so development would proceed without sufficient discussion. In this work, I want to raise a discussion to the people about the future mixed sexuality and technology by presenting obvious Utopia and Dystopia about sexual affair.